A combination of new and better technologies could slash costs of reducing greenhouse gases by trillions of dollars in this century, a new report says. A new report from the Global Energy Technology Strategy Program concludes that the cost of stabilizing atmospheric concentrations of greenhouse gases can be reduced by trillions of dollars in this century, if current energy technologies are improved and emerging ones are developed and deployed. The May 2007 report, "Global Energy Technology Strategy: Addressing Climate Change Phase 2 Findings from an International Public-Private Sponsored Research Program," summarizes nearly a decade of detailed research on the role technology will play in addressing climate change. Rather than ranking the technologies or identifying a single "best" one, the analysis looked at the combined performance under various conditions that could occur this century. The report concludes that the six technology classes, deployed together at a large scale, could eliminate tens to hundreds of billions of tons of greenhouse gases over the course of the century, at trillions of dollars less than today's energy mix would. The analysis is the first to delve deeply into the economics of the potential solutions. This is important because understanding the economic framework helps decision-makers balance the costs of energy technology development against other societal priorities, according to the report's lead author, Jae Edmonds of the Global Energy Technology Strategy Program. A distinguishing feature of the analysis was looking at the technologies' ability to cost-effectively deliver goods and services that consumers want while simultaneously reducing greenhouse gases. "This market-based approach reveals the solutions that are the most robust for real-world deployment," Edmonds said. The entire portfolio of technologies is necessary to manage the risks and costs of climate change and to respond to evolving conditions, the authors conclude. "All the technologies together lower the cost more than any single one, or any combination fewer than the total of six," said Elizabeth Malone, one of the report's authors. "Though certain technologies will perform better than others, if you take any one out of the mix, the total cost goes up," she said. The report also outlines the research and development needed for each technology area and the benefits of including greenhouse gases other than carbon dioxide in the technology strategies. Government organizations, businesses, and other organizations are using the report to inform decisions about research and technology development. 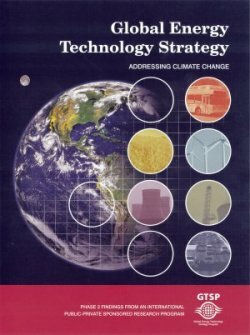 The 2001 Phase 1 research report argued for the need for a technology strategy to address climate change. The Phase 2 report lays the groundwork to craft such a strategy by assessing technologies in the context of global energy and economic systems. In Phase 3, expected to continue through 2010, researchers will extend the Global Energy Technology Strategy Program to explore the regional and institutional dimensions of developing and deploying technologies. The full Phase 2 report and its executive summary, as well as the Phase I report, are online. For a hard-copy version of the Phase 2 report, contact Kathryn Lang or (509) 375-3837. Acknowledgments: The research team included Jae Edmonds, Marshall Wise, Jim Dooley, Son H. Kim, Stephen Smith, Paul Runci, Leon Clarke, Elizabeth Malone, and Gerry Stokes, all of the Pacific Northwest National Laboratory and the Joint Global Change Research Institute, a joint collaboration between the Pacific Northwest National Laboratory and the University of Maryland. This research was supported by the U.S. Department of Energy's Office of Science, Rio Tinto, and the Electric Power Research Institute, with additional support from the California Energy Commission, the Global Climate Research Area and Nuclear Sector of the Gas Research Institute, General Motors Corporation, Kansai Electric Power, the National Energy Technology Laboratory, and Japan's National Institute for Environmental Studies. The Global Energy Technology Strategy Program, with public and private sponsorship, investigates the potential role of energy technologies in addressing global climate change. The Program is led by a core group of scientists from Battelle and the Department of Energy's Pacific Northwest National Laboratory, as well as the Joint Global Change Research Institute, which is a partnership between PNNL and the University of Maryland. Research is conducted in collaboration with scientists from institutions around the world. An international steering group, representing diverse perspectives and interests from government agencies, research institutions, and private industry, guides the GTSP research agenda.